The Sacred Grove in Palmyra, New York, is the site where Heavenly Father and His Son, Jesus Christ, visited young Joseph Smith in 1820. That visit, often called the First Vision, was the founding event of The Church of Jesus Christ of Latter-day Saints. 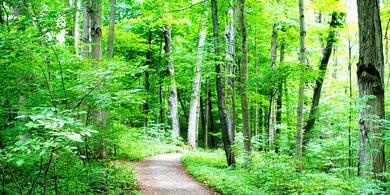 The Sacred Grove was part of the farmland originally owned by the Smith family, and today it is a healthy and peaceful forest that is open to the public year-round. Winding paths provide many places for visitors to contemplate the event that occurred here. 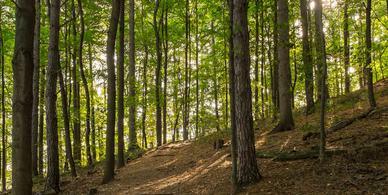 For information about visiting the Sacred Grove and Joseph Smith’s boyhood home, click or tap here. 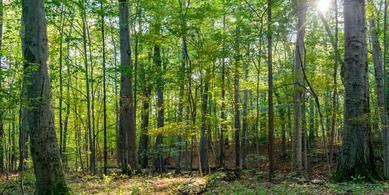 On a spring day in 1820, 14-year-old Joseph Smith went alone to this grove of trees and prayed. He was confused about the claims of different religions in the area, and he wanted to know which church he should join. Heavenly Father and Jesus Christ came in answer to his prayer. Their answer changed his life, and it continues to change the lives of millions of people throughout the world. To learn more about the events that brought Joseph Smith to pray in the Sacred Grove, click or tap here. The Smith Family Farm, in Palmyra and Manchester, New York, is open to the public year-round. 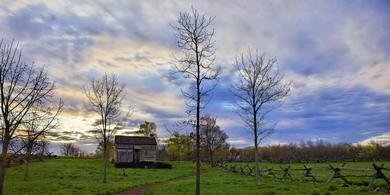 This historic site is located on the 100 acres of land cultivated by the Smith family in the 1820s. Tours and markers on the site tell about Joseph Smith’s First Vision and his first visits with the angel Moroni. They also describe the Smith family’s life on the farm. Tours of the farm include a reconstruction of Joseph Smith’s boyhood home, a restoration of a larger home the family later built, and the stand of trees now known as the Sacred Grove. For information about visiting the Smith Family Farm, click or tap here. Several founding events for The Church of Jesus Christ of Latter-day Saints took place on the Smith Family Farm. Here God the Father and His Son Jesus Christ visited the 14-year-old Joseph Smith—an experience now called The First Vision. 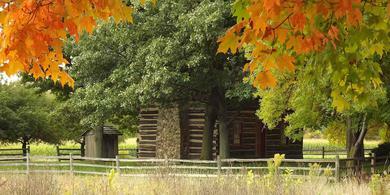 On September 21, 1823, the angel Moroni first visited Joseph Smith in the family’s small log home. Four years later, Joseph and his wife, Emma, lived in the larger Smith family home with his family when he received the golden plates on the Hill Cumorah. Eight individuals, now known as the Eight Witnesses of the Book of Mormon, were shown the golden plates while visiting the Smith Family Farm in the summer of 1829. The Hill Cumorah in Manchester, New York, is the place where Joseph Smith met annually with the angel Moroni from 1823 to 1827. On September 22, 1827, the angel allowed Joseph to obtain the golden plates from which the Book of Mormon would be translated. Today this historic site is open to the public year-round. The site includes trails to the top of the hill and a visitors’ center featuring exhibits, historical artifacts, and a film about the founding of The Church of Jesus Christ of Latter-day Saints. A monument at the top of the hill commemorates the events that took place there. For information about visiting the Hill Cumorah, click or tap here. The events that took place at the Hill Cumorah were foundational to the establishment of The Church of Jesus Christ of Latter-day Saints. Directed by the angel Moroni, Joseph Smith found the golden plates deposited in the hill on September 22, 1823, approximately three miles from his home. Joseph met the angel there on the same date the next four years until he was finally allowed to obtain the plates. From those plates, he later translated the Book of Mormon by the gift and power of God. In the 1820s, the hill did not have a name. It later became known as the Hill Cumorah because Moroni, the Book of Mormon’s final author and the angel who met with Joseph Smith, wrote that he had hidden the golden plates in a hill called Cumorah (see Mormon 6:6). A monument designed by Torleif S. Knaphus was placed on the hill in 1935. To learn more about the events that brought Joseph Smith to the Hill Cumorah and about the translation and publication of the Book of Mormon, click here. The Book of Mormon Historic Publication Site in Palmyra, New York, is the place where the first copies of the Book of Mormon were printed and bound in 1829 and 1830. It is also known as the Grandin Building, after Egbert B. Grandin, who owned and operated a printshop in the building. Today this historic site is open to the public year-round. 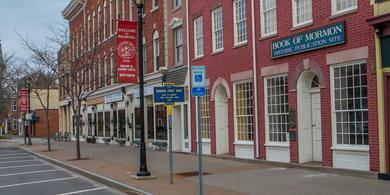 It features restorations of the original bookstore, printer’s office, printing press, and bindery. It also features exhibits about Joseph Smith, the Book of Mormon, and the Restoration of the gospel of Jesus Christ. For information about visiting the Book of Mormon Historic Publication Site, click or tap here. E. B. Grandin agreed to print 5,000 copies of the Book of Mormon in June 1829 for a cost of $3,000. From August 1829 to March 1830, Grandin and his staff worked to typeset, print, and bind the Book of Mormon in this building. Copies of the book were first sold to the public at Grandin’s bookstore on March 26, 1830. Since then, more than 176 million copies of the book have been printed in more than 100 languages. For more information about the publication of the Book of Mormon, click or tap here. The Peter Whitmer Farm, located near Fayette, New York, is the place where The Church of Jesus Christ of Latter-day Saints was organized in 1830. This historic site is open to the public. A reconstructed log home and a visitors’ center commemorate events associated with the organization of the Church. The visitors’ center includes artifacts, a film, and interactive displays about the translation of the Book of Mormon and the founding and growth of the Church. For information about visiting the Whitmer farm, click or tap here. Peter and Mary Whitmer allowed Joseph Smith and Oliver Cowdery to live in their home in June 1829 so the two men could complete the translation of the Book of Mormon. Joseph’s wife, Emma, later joined them there. The Whitmer farm was also the place where the angel Moroni showed three men, now known as the Three Witnesses, the golden plates from which the Book of Mormon was translated. On April 6, 1830, about 55 people gathered in the Whitmers’ home, where Joseph Smith presided over the organization of The Church of Jesus Christ of Latter-day Saints. On the 150th anniversary of the organization of the Church, President Spencer W. Kimball presided over a session of the Church’s general conference held at the Peter Whitmer Farm. On this occasion, President Kimball also dedicated the reconstructed log home. Today the Church’s membership is greater than 16 million. Latter-day Saints gather each Sunday in more than 30,000 congregations throughout the world. Find information that can help you plan a visit to the Smith Family Farm and Sacred Grove, the Hill Cumorah, the Book of Mormon Historic Publication Site, the Peter Whitmer Farm, and the Priesthood Restoration Site.